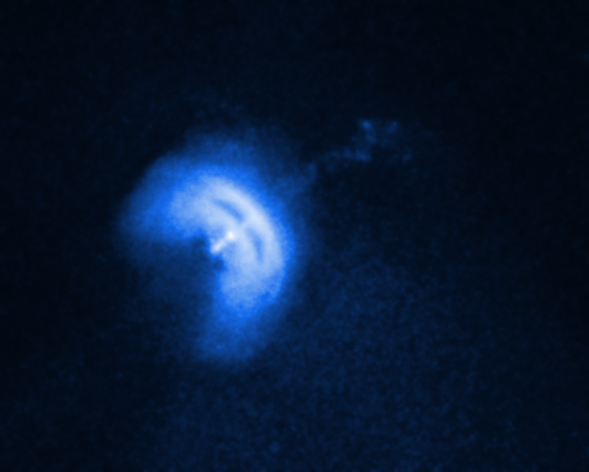 A movie from NASA's Chandra X-ray Observatory shows a fast moving jet of particles produced by a rapidly rotating neutron star, and may provide new insight into the nature of some of the densest matter in the universe. The star of this movie is the Vela pulsar, a neutron star that was formed when a massive star collapsed. The Vela pulsar is about 1,000 light years from Earth, is about 12 miles in diameter, and makes over 11 complete rotations every second, faster than a helicopter rotor. As the pulsar whips around, it spews out a jet of charged particles that race out along the pulsar's rotation axis at about 70% of the speed of light. 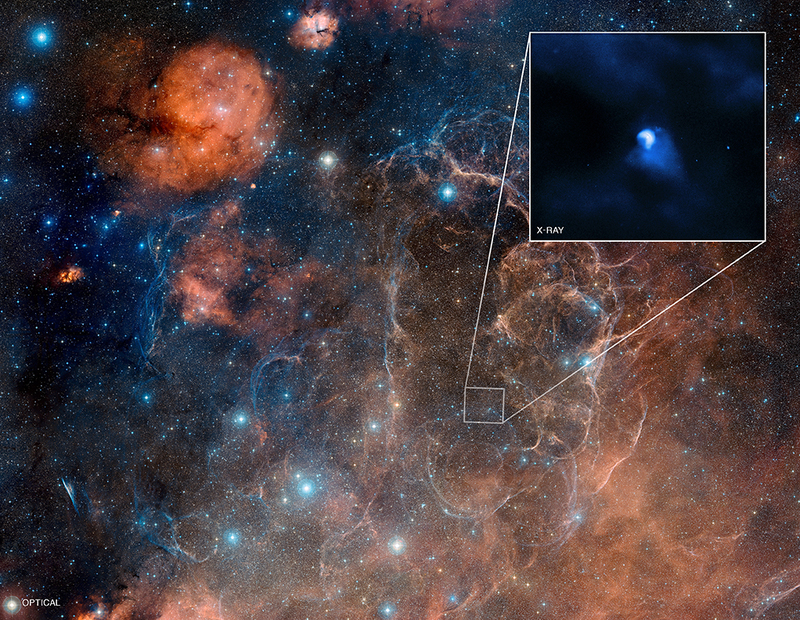 In this single image from the observations included in the movie, the location of the pulsar and the 0.7 light year-long jet are labeled. Also shown on the right are a stacked image of all the Chandra observations from the data set, and a wide-field view of the X-ray data. 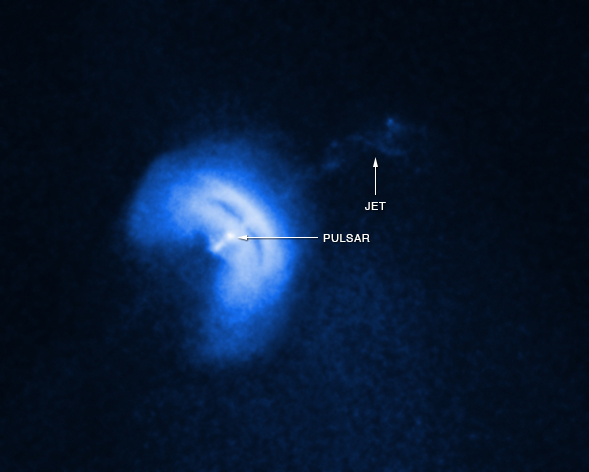 The Chandra data set contains 8 images obtained between June and September 2010, and suggests that the pulsar may be slowly wobbling, or precessing, as it spins. The shape and the motion of the Vela jet look strikingly like a rotating helix, a shape that is naturally explained by precession, as shown in the animation. 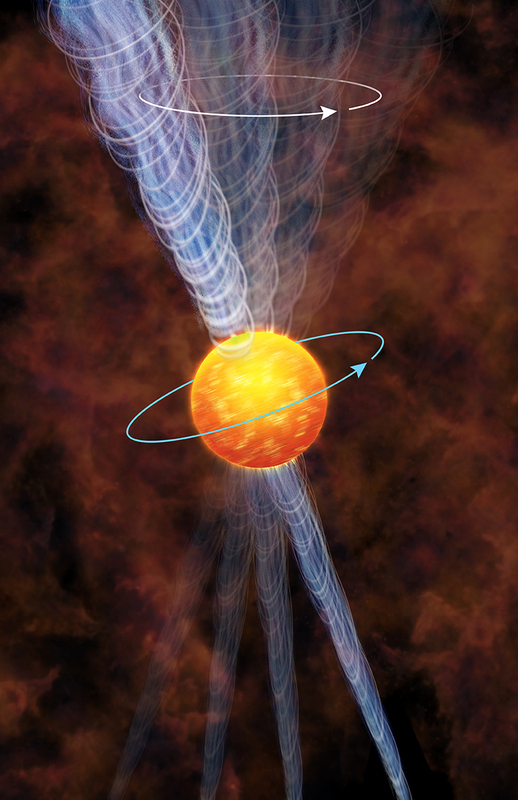 If the evidence for precession of the Vela pulsar is confirmed, it would be the first time that a jet from a neutron star has been found to be wobbling, or precessing, in this way. 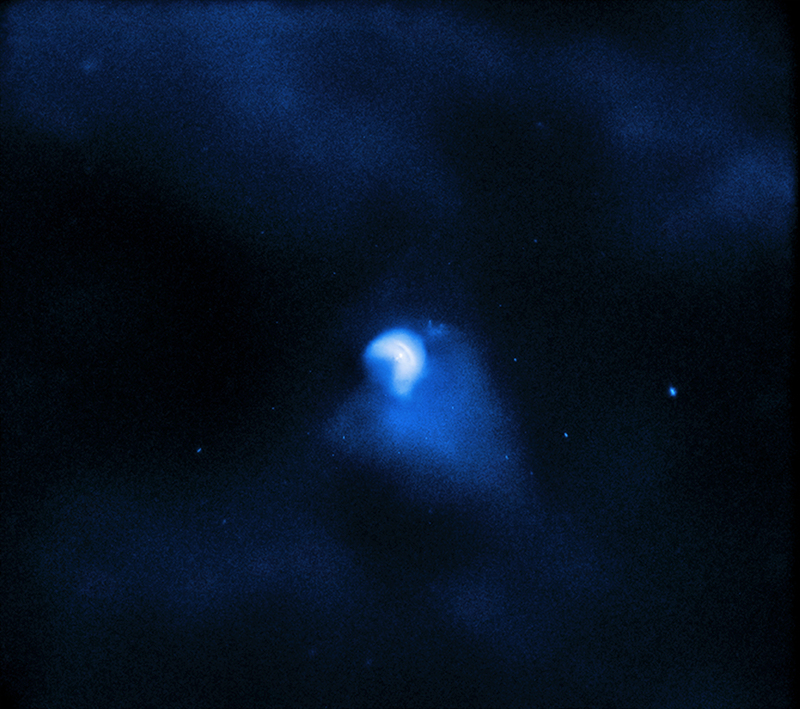 This is an artist's impression showing the Vela pulsar and its jet. The pulsar is a rapidly rotating neutron star that is producing a net of particles, shown in blue, moving at 70 percent of the speed of light, and some tangled magnetic fields. 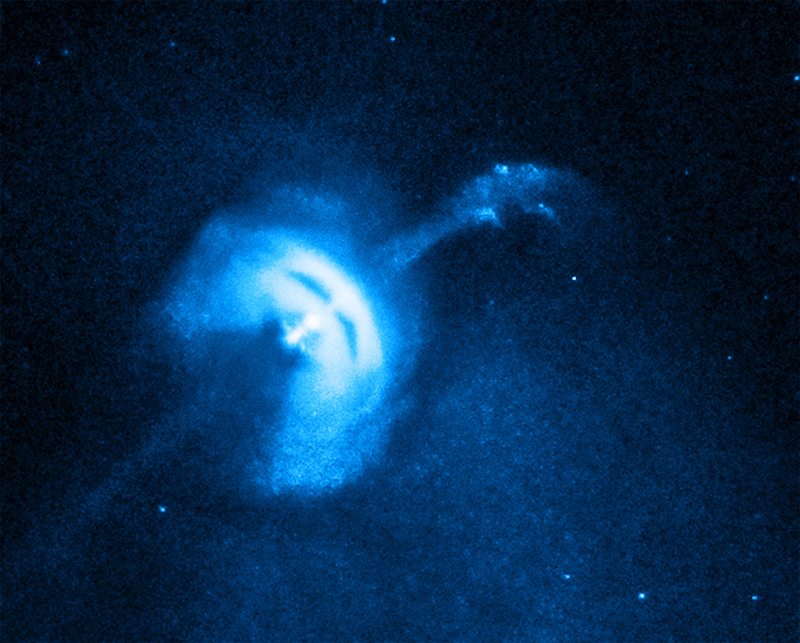 If the pulsar is precessing, or wobbling, as it spins, it can produce a corkscrew-shaped jet. The supernova that formed the Vela pulsar exploded over 10,000 years ago. 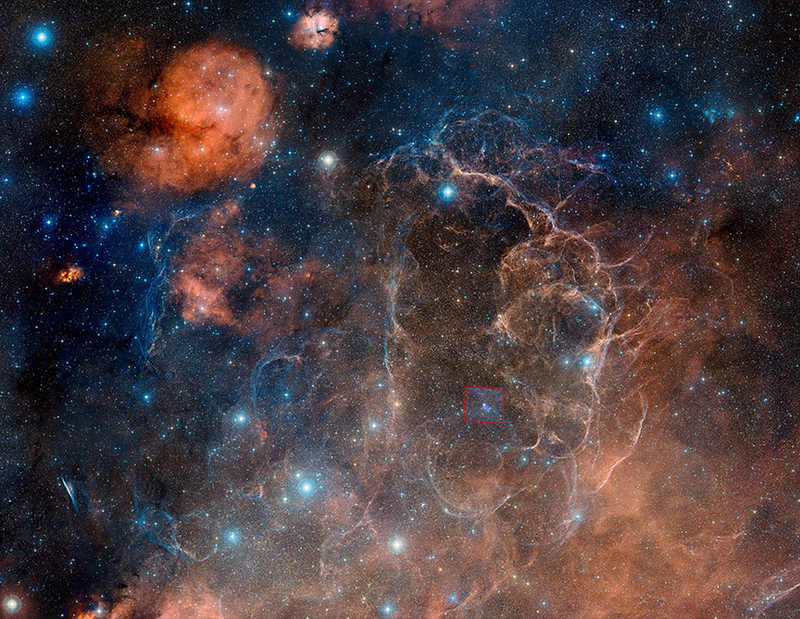 This optical image from the Anglo-Australian Observatory's UK Schmidt telescope shows the enormous apparent size of the supernova remnant formed by the explosion. The full size of the remnant is about eight degrees across, or about 16 times the angular size of the moon. The square near the center in the image on the left shows the Chandra image with a larger field-of-view than used for the movie, with the Vela pulsar in the middle. Scale: Wide field optical is 9.3 x 8.5 deg.